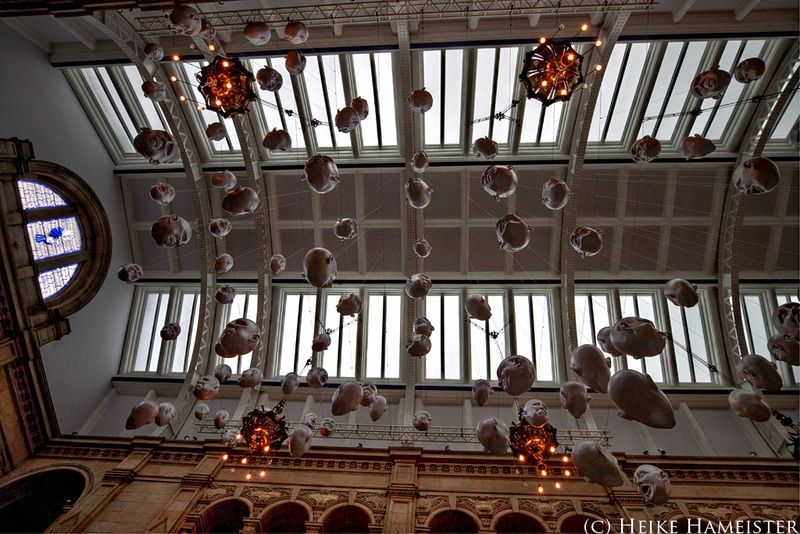 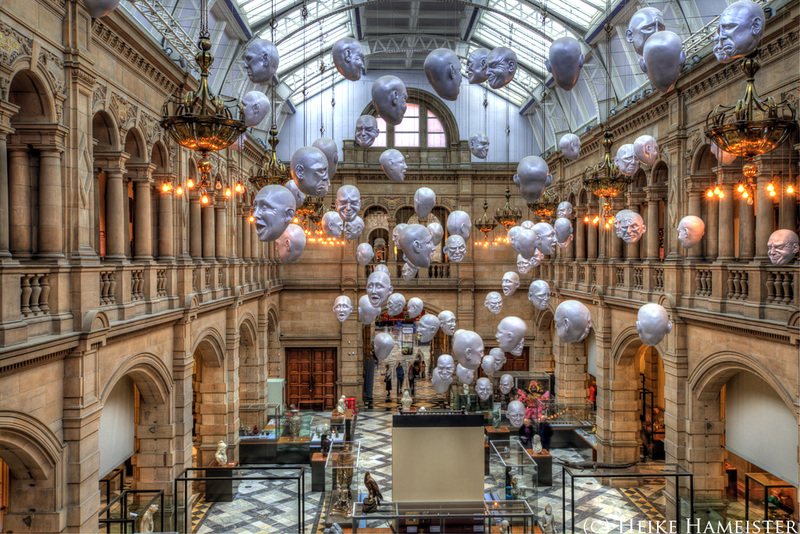 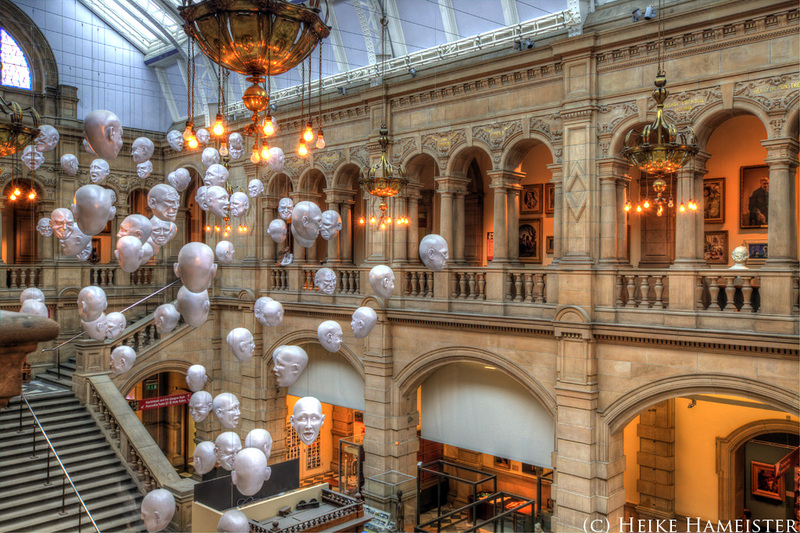 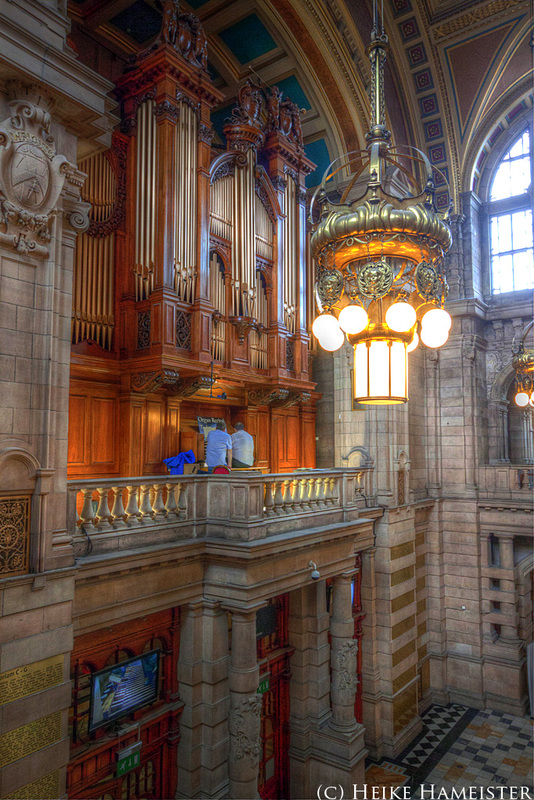 Kelvingrove Art Gallery und Museum ist Glasgows größtes Museum und Kunstgalerie und besitzt eine der größten städtischen Kunstkollektionen Europas. 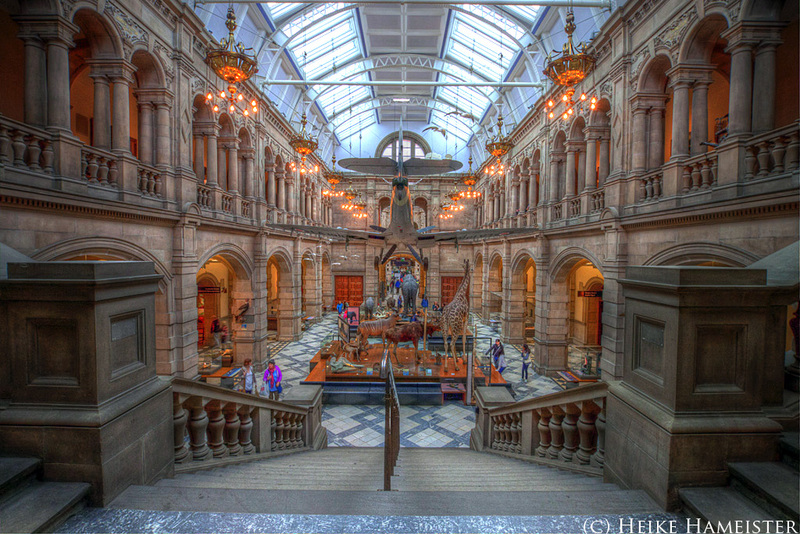 Der Bau von Kelvingrove wurde teilweise aus den Erlösen der Internationalen Ausstellung des Jahres 1888 finanziert, die im Kelvingrove Park stattfand. 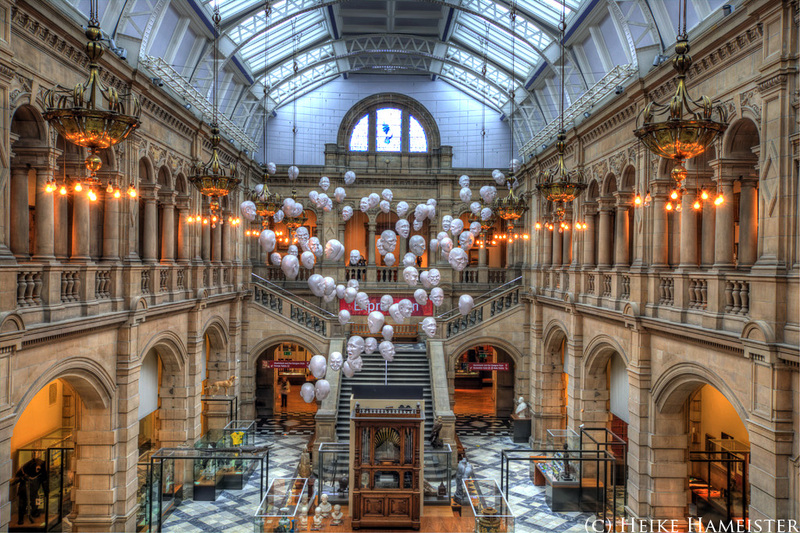 Die Kelvingrove Art Gallery wurde 1902 eröffnet. 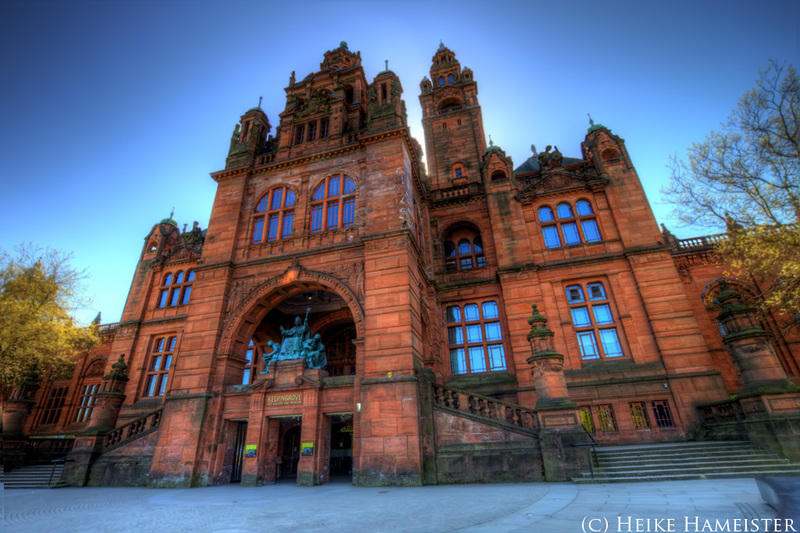 Das Gebäude ist im spanischen Barockstil erbaut und folgt der Tradition Glasgows, roten Sandstein zu verwenden. 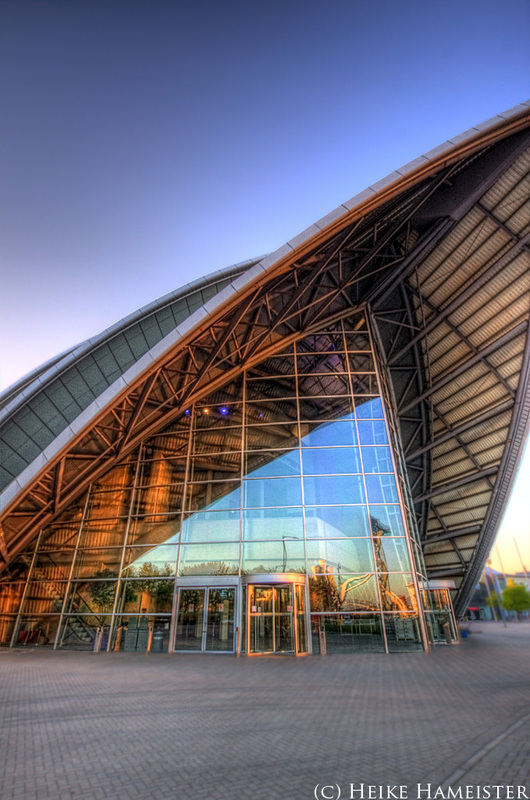 Ein weitverbreitetes Gerücht sagt, das Gebäude sei falsch herum erbaut wurden und der Architekt hätte Selbstmord begangen, indem er von einem der Türme sprang (oder sich erhängte). 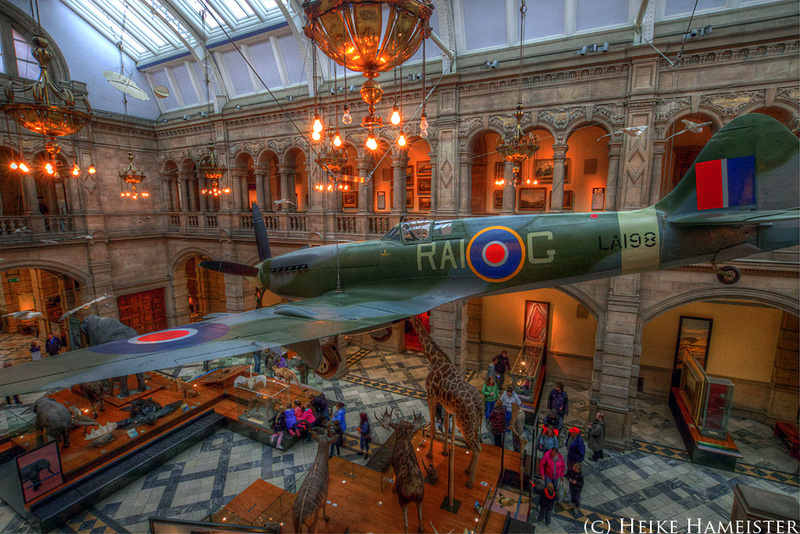 Dies ist falsch und kommt wahrscheinlich daher, dass sich der Haupteingang des Museums im Kelvingrove Park befindet, die meisten Besucher das Gebäude jedoch von der Argyle Street aus betreten [Wikipedia]. 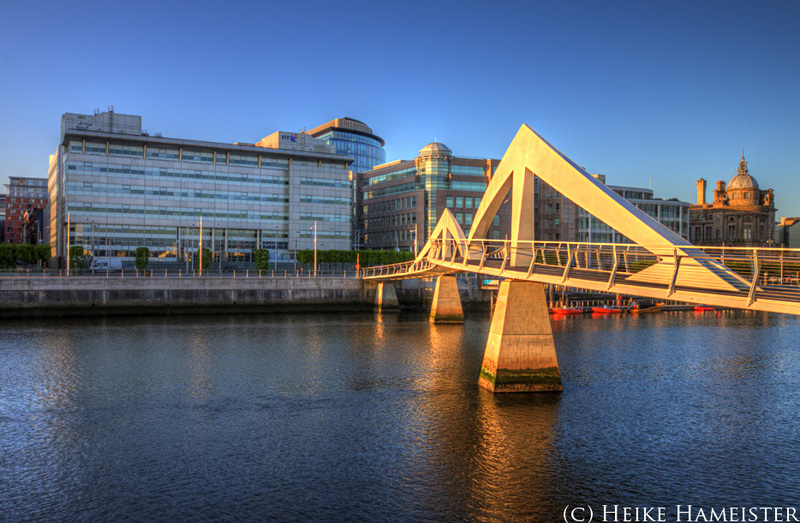 These photos were taken during a very sunny and warm April evening in Glasgow. 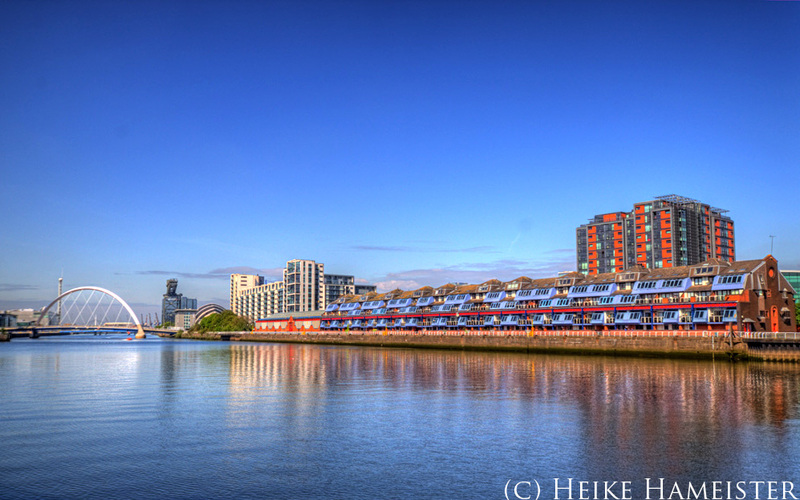 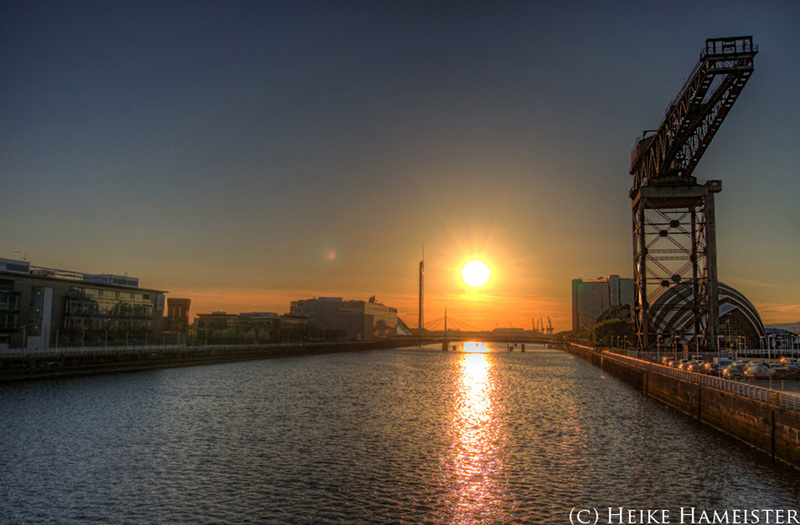 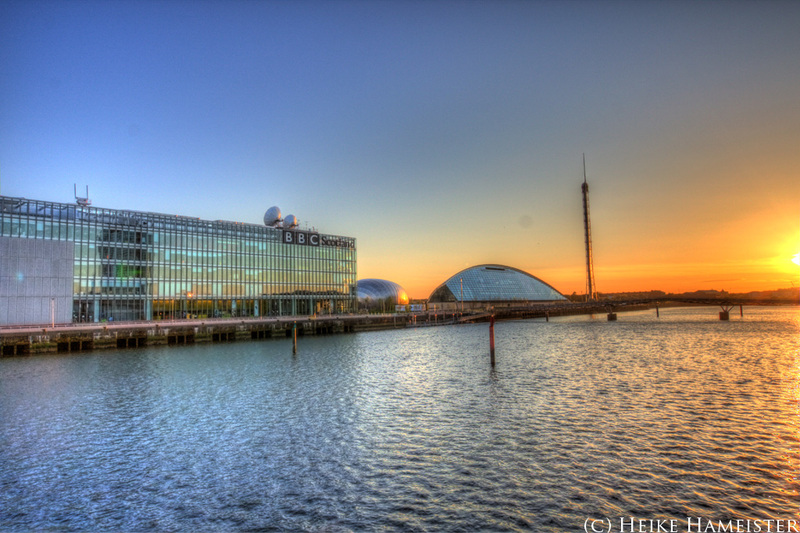 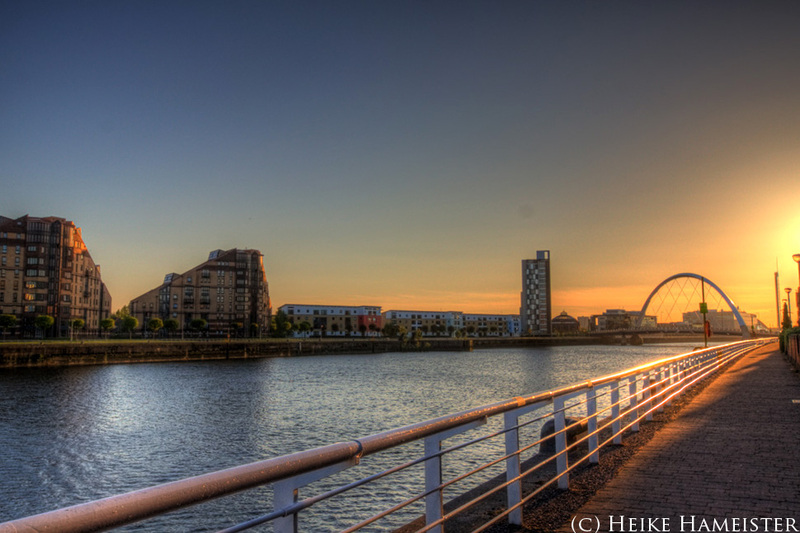 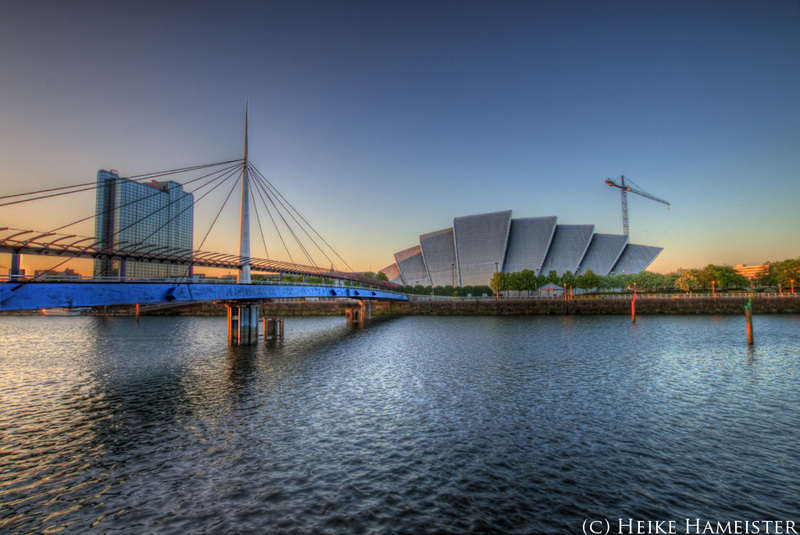 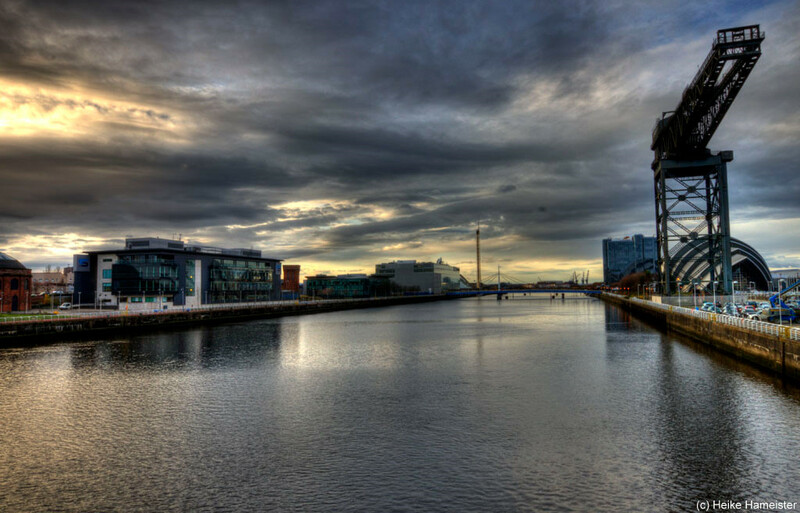 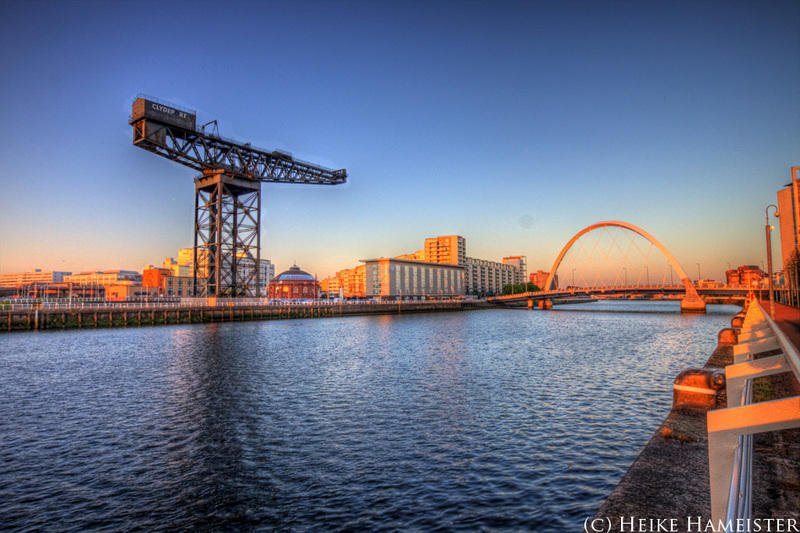 The former docklands site on the south bank of the River Clyde is the site of the Glasgow Science Centre, Glasgow Tower and the headquarter for the BBC Scotland and STV. 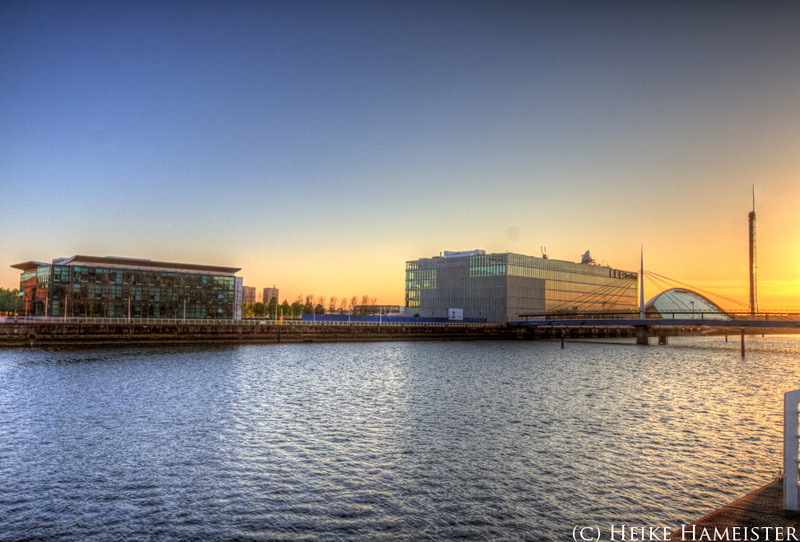 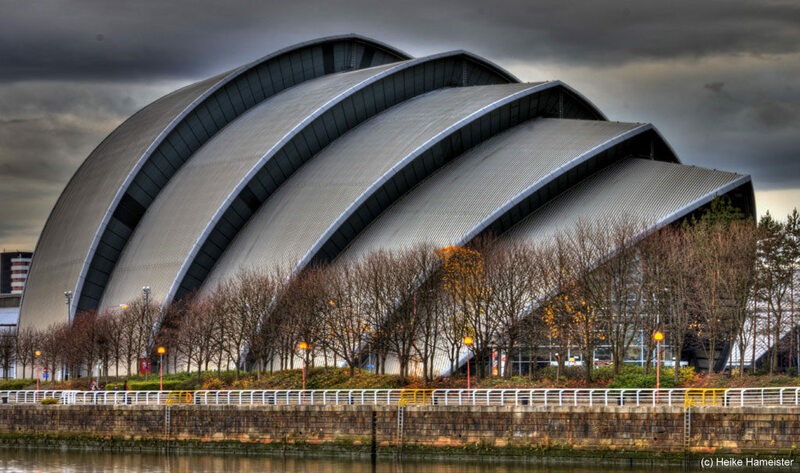 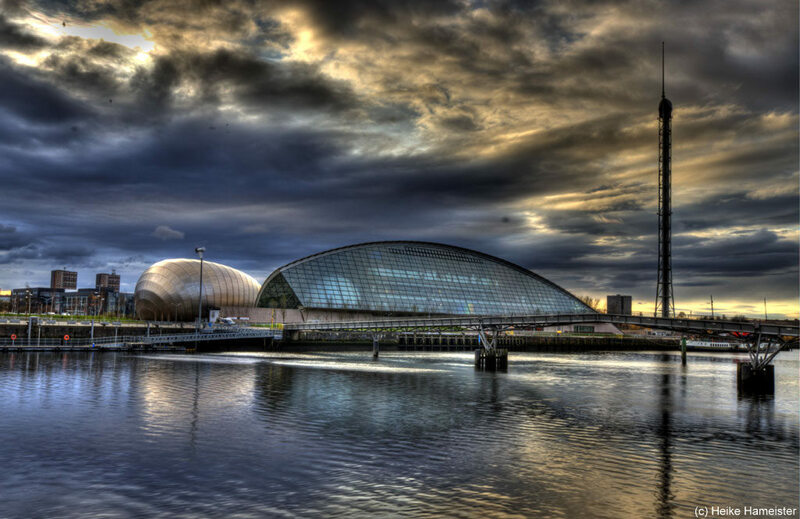 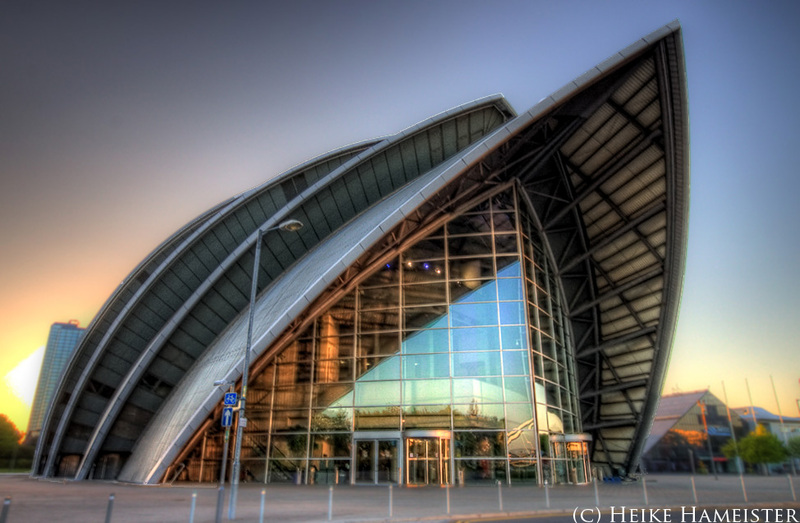 At the opposite, the Clyde Auditorium (Armadillo) and other new buildings found their places. 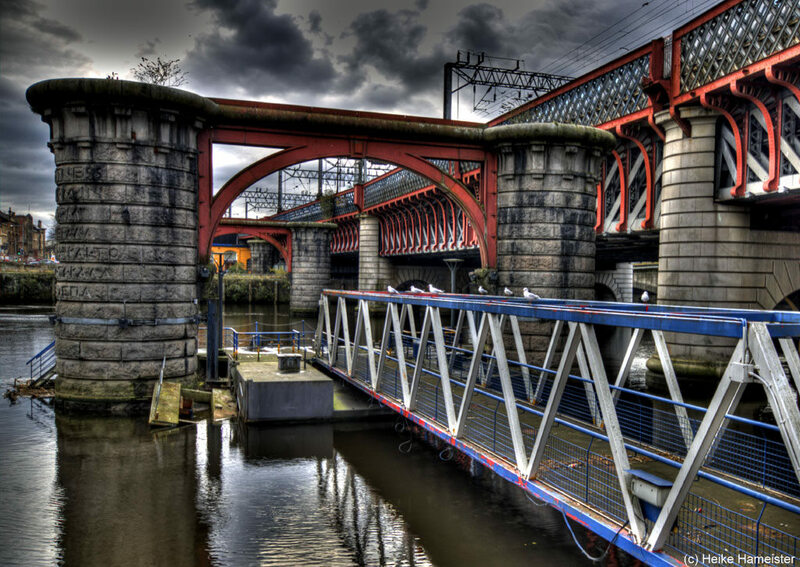 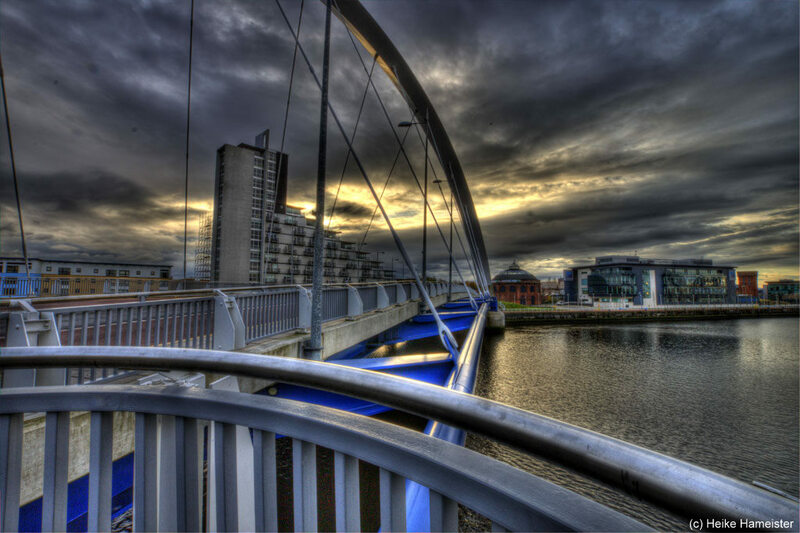 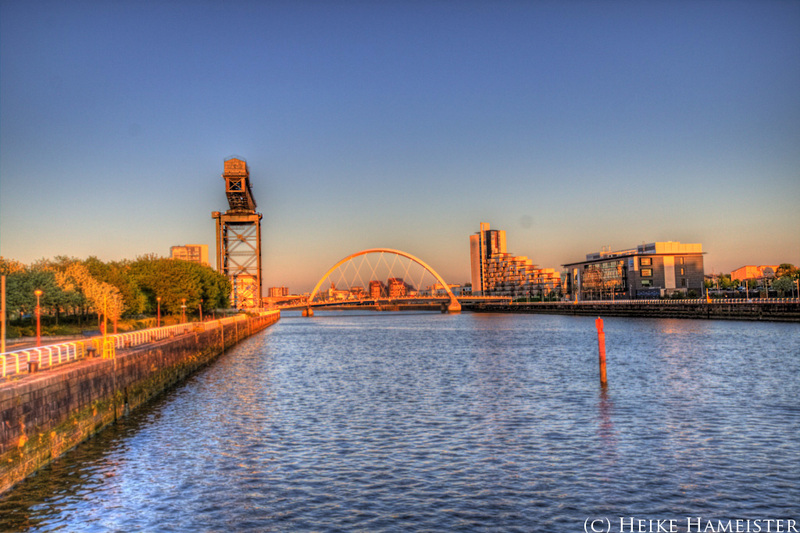 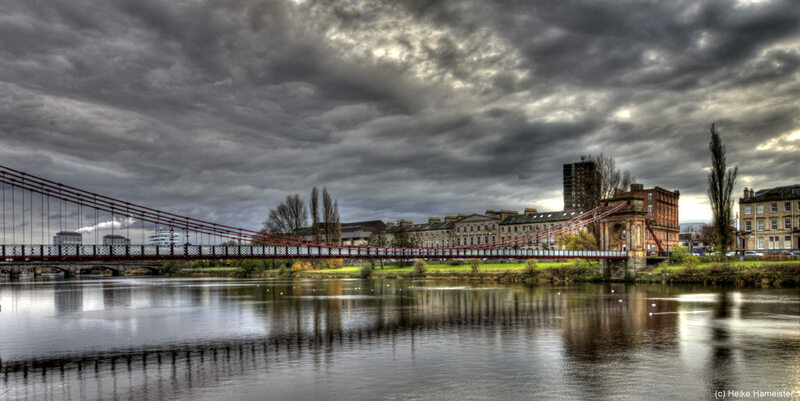 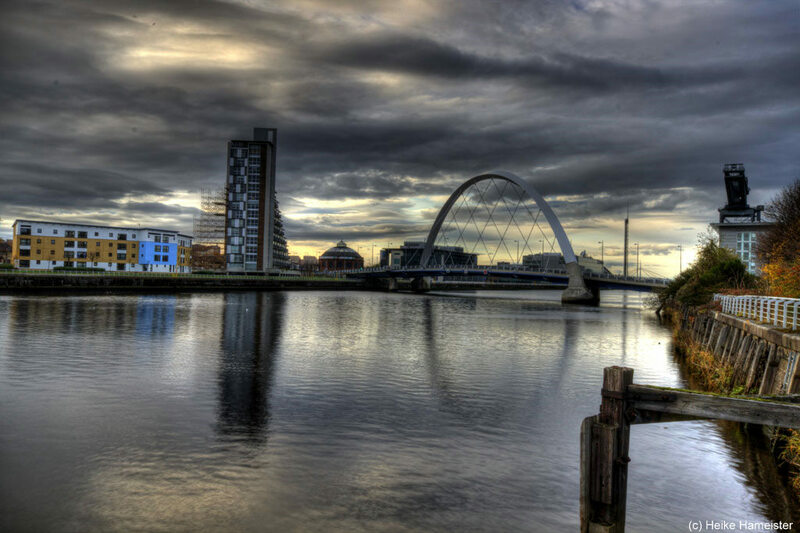 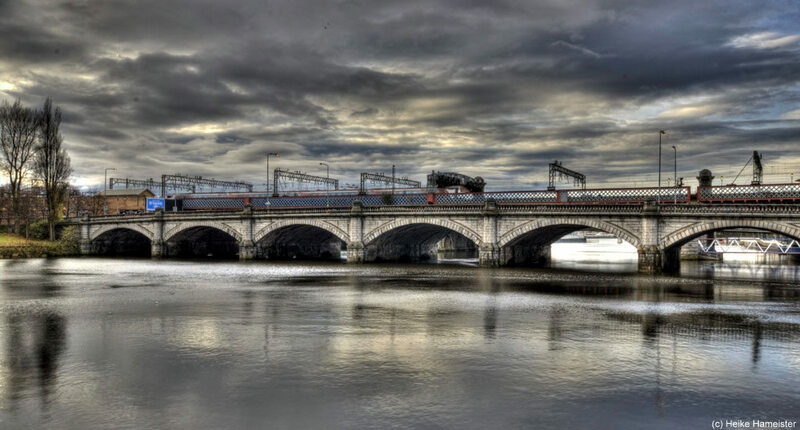 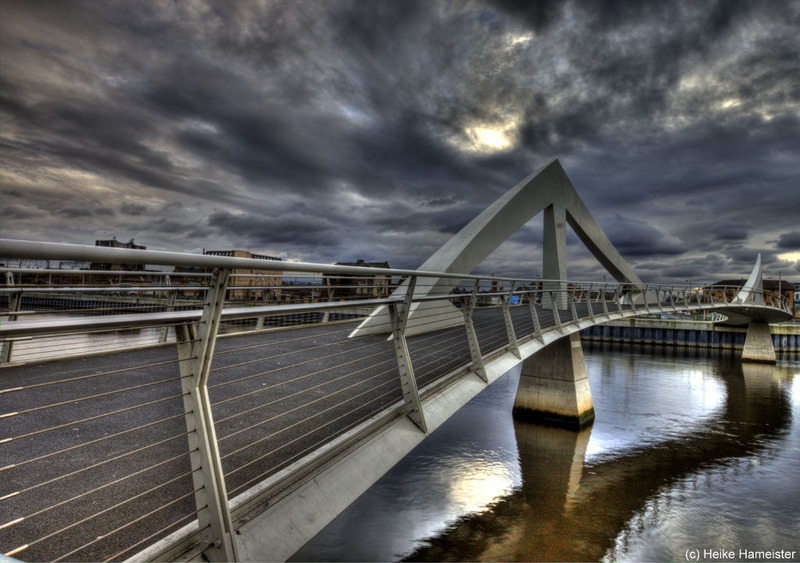 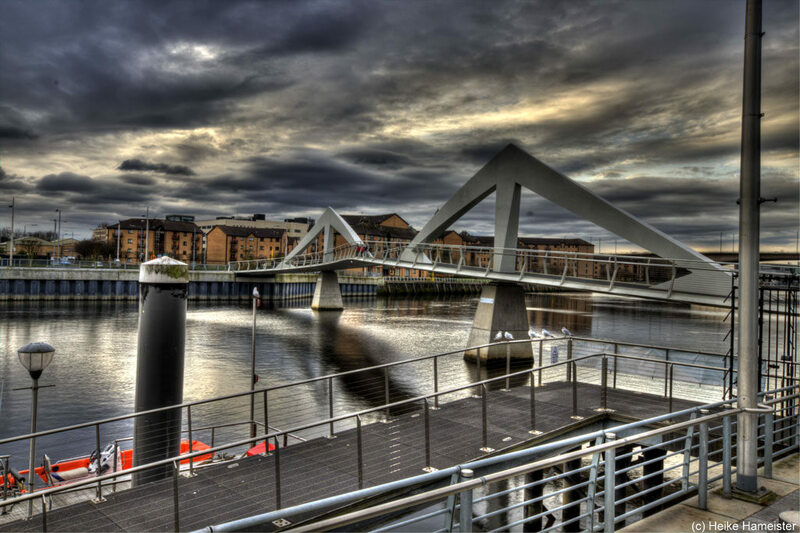 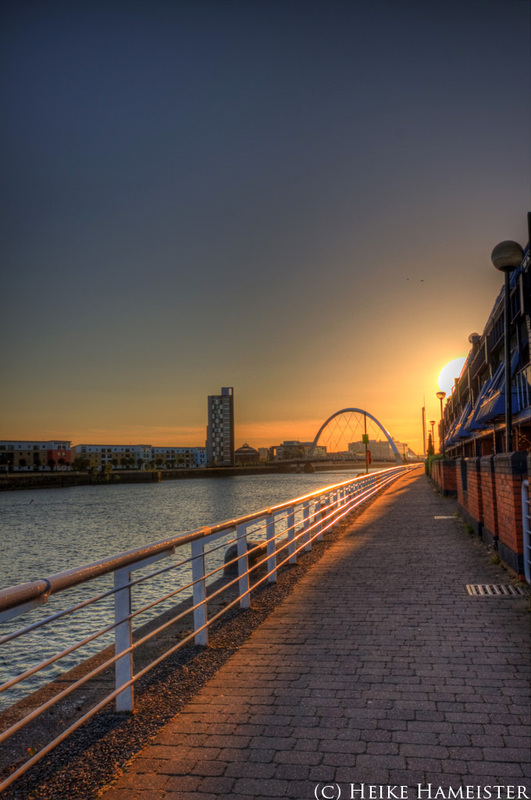 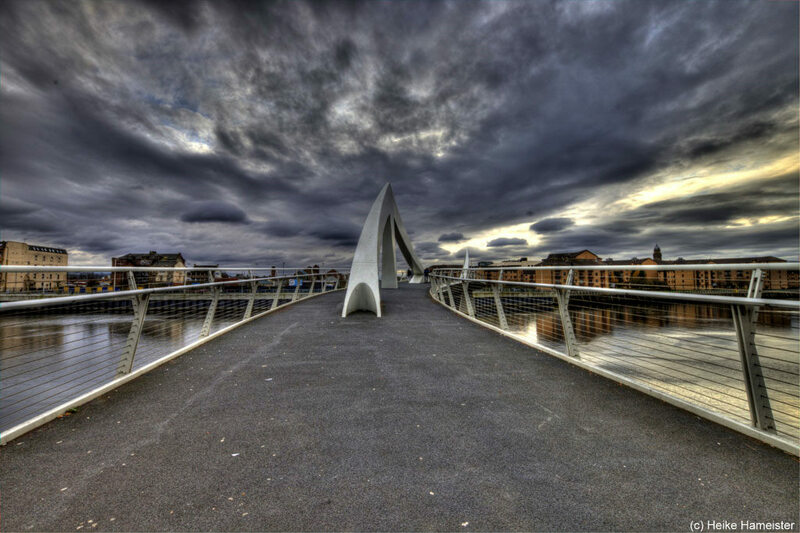 In addition, several new bridges spanning the River Clyde have been built, including the Clyde Arc Bridge (Squinty Bridge) and others at Tradestone and Springfield Quay. 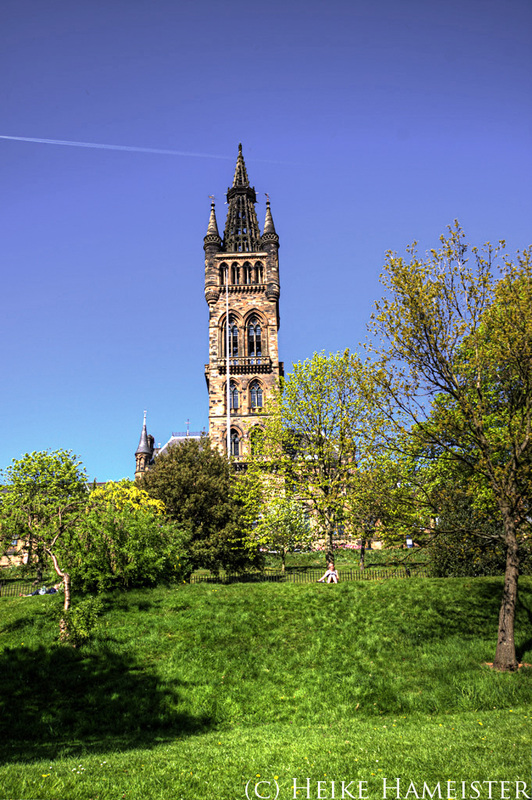 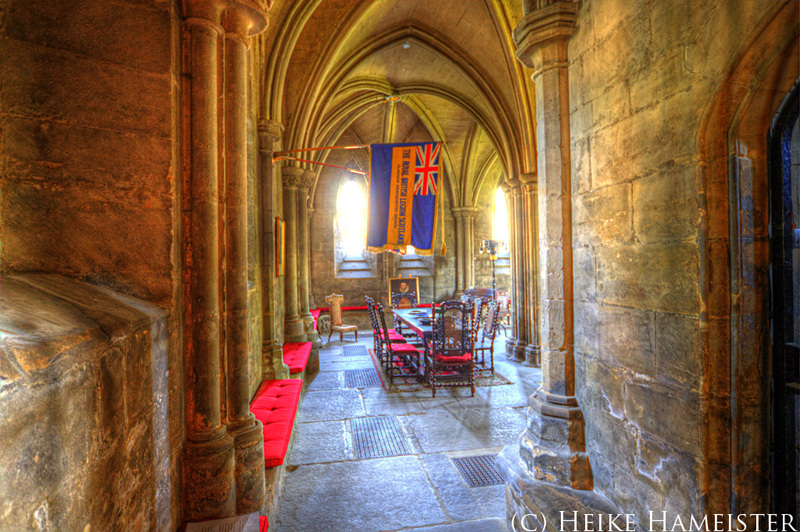 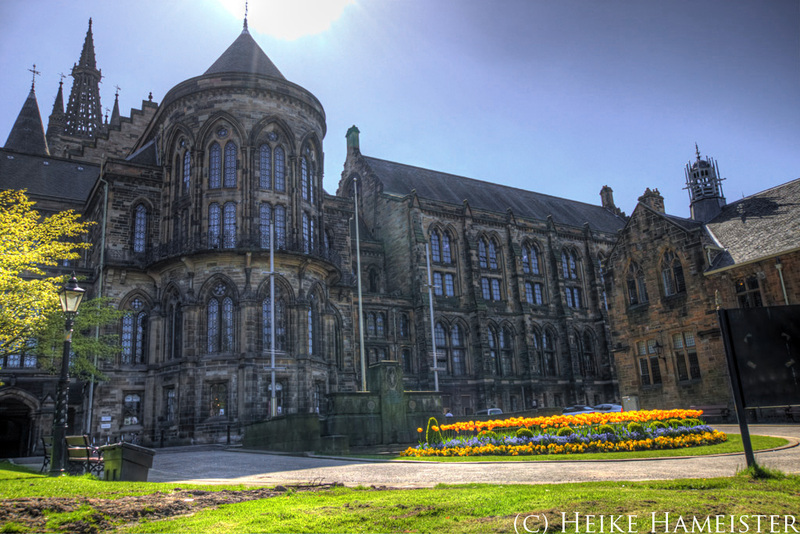 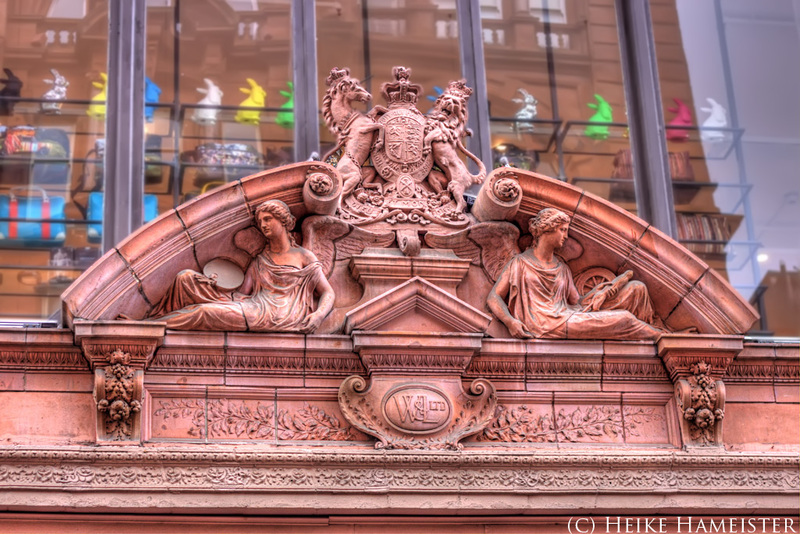 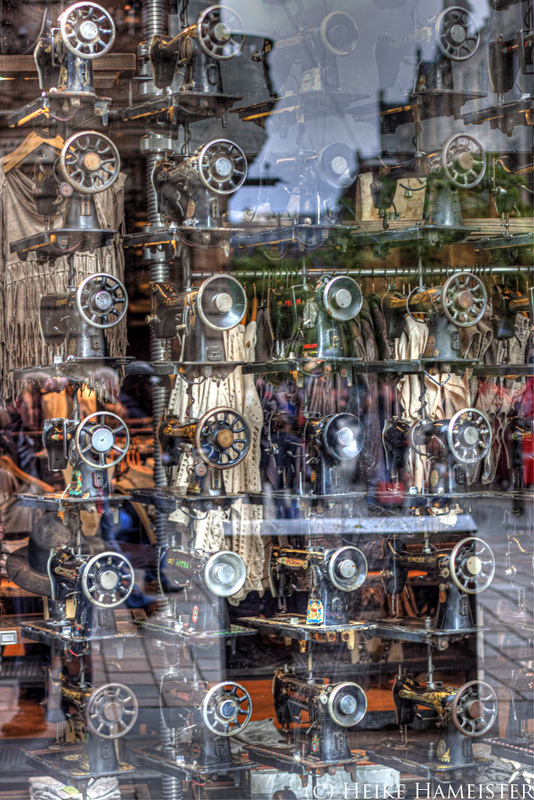 The University was founded in 1451 and is located on Gilmorehill in the West End of the city. 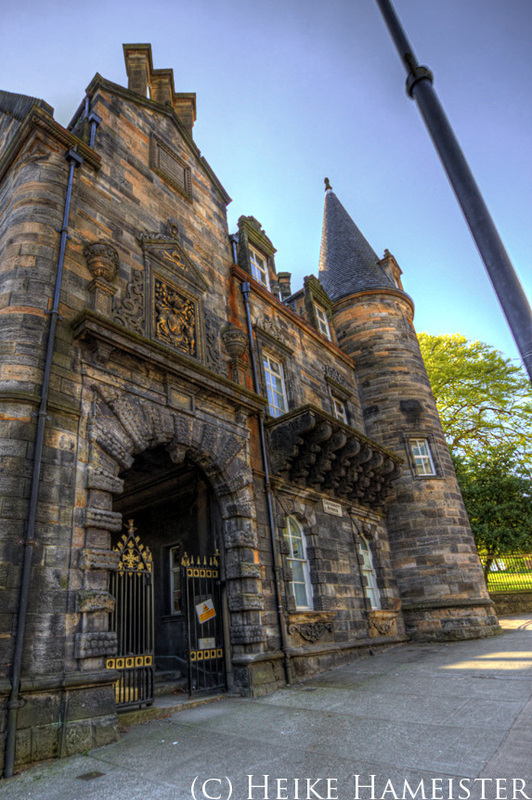 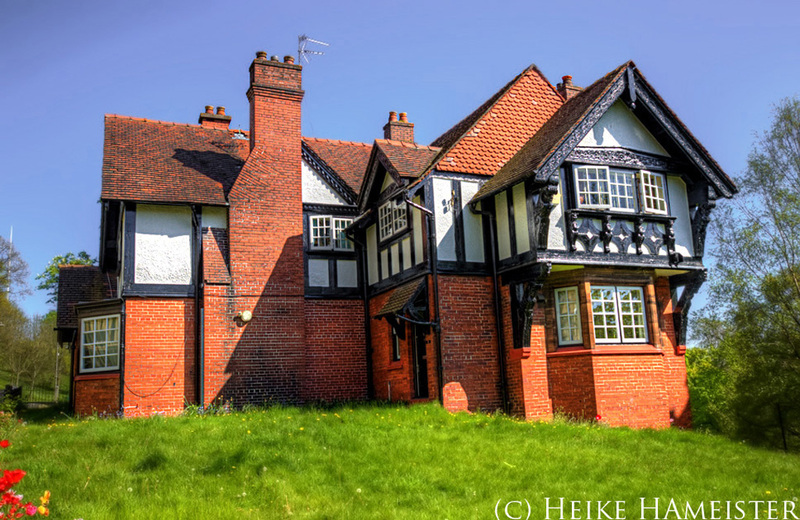 Most of the buildings are designed in the Gothic revival style. 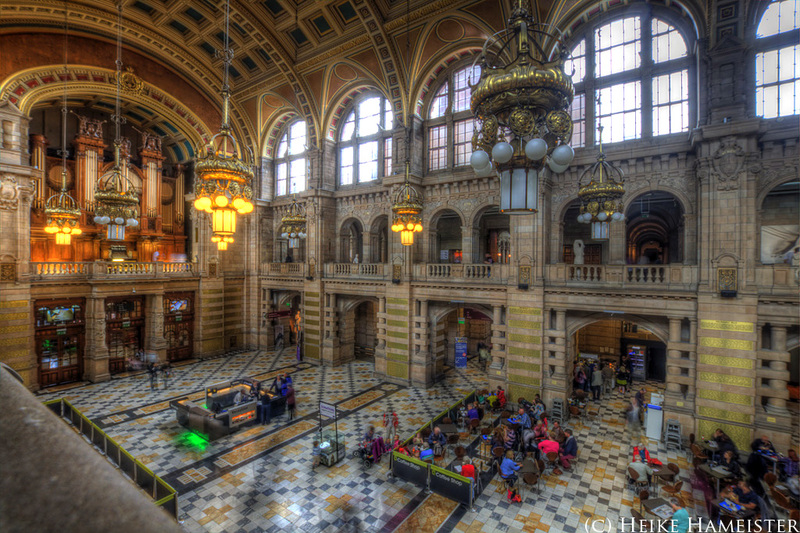 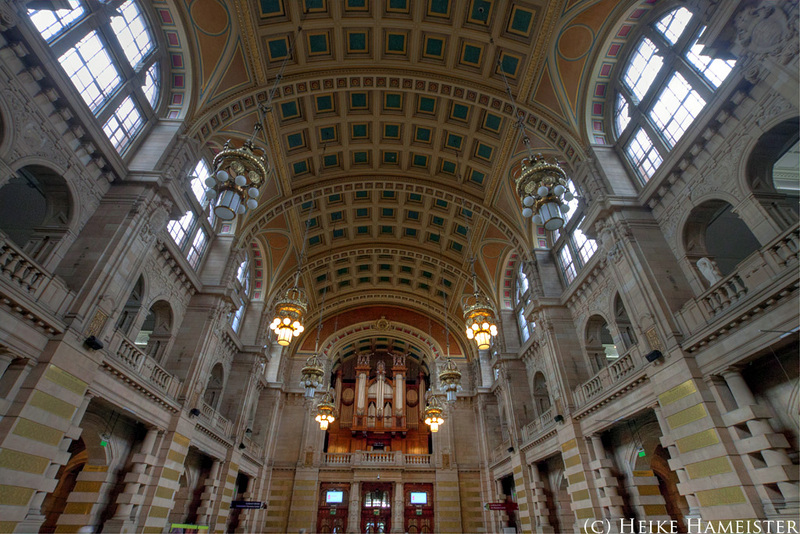 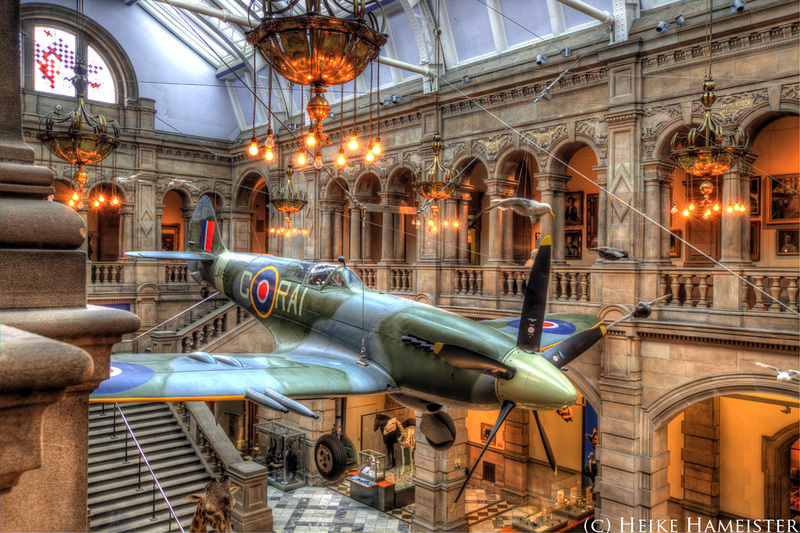 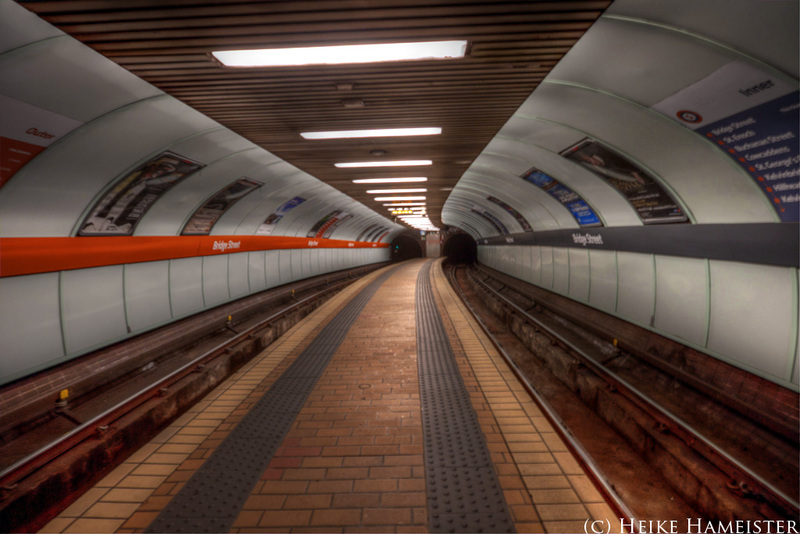 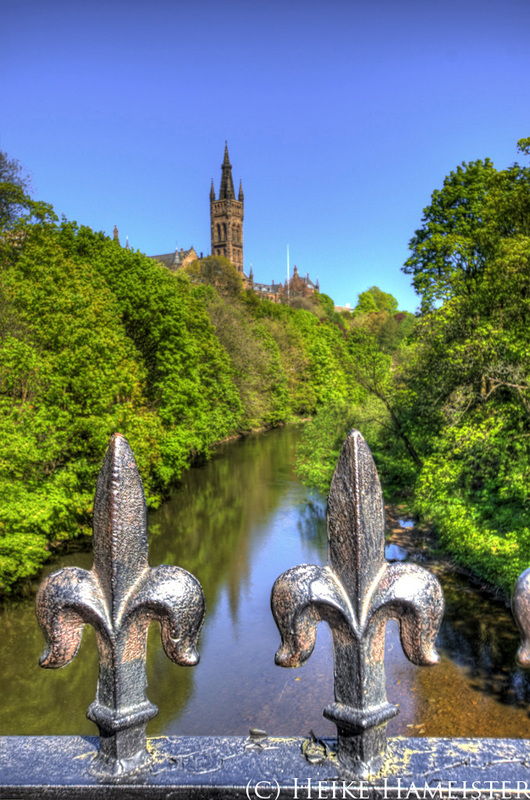 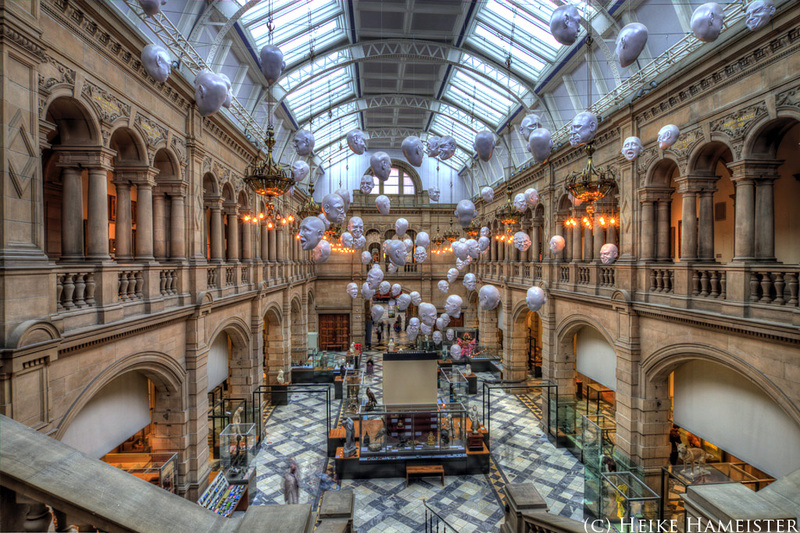 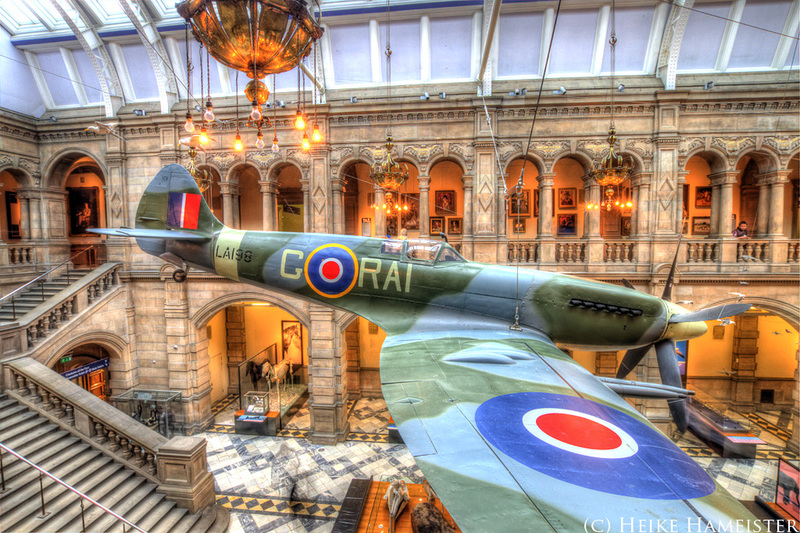 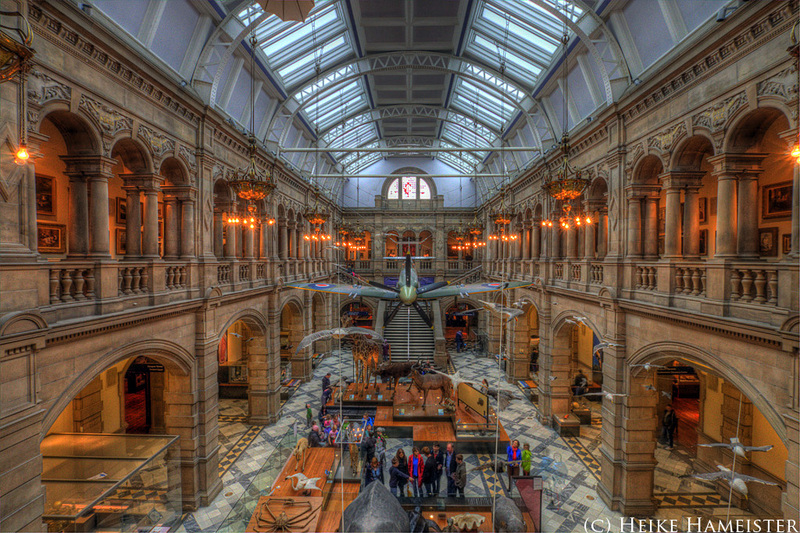 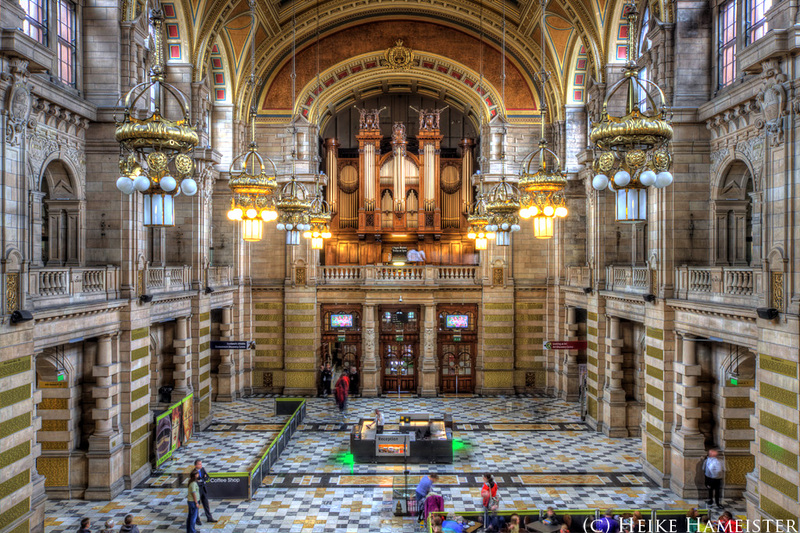 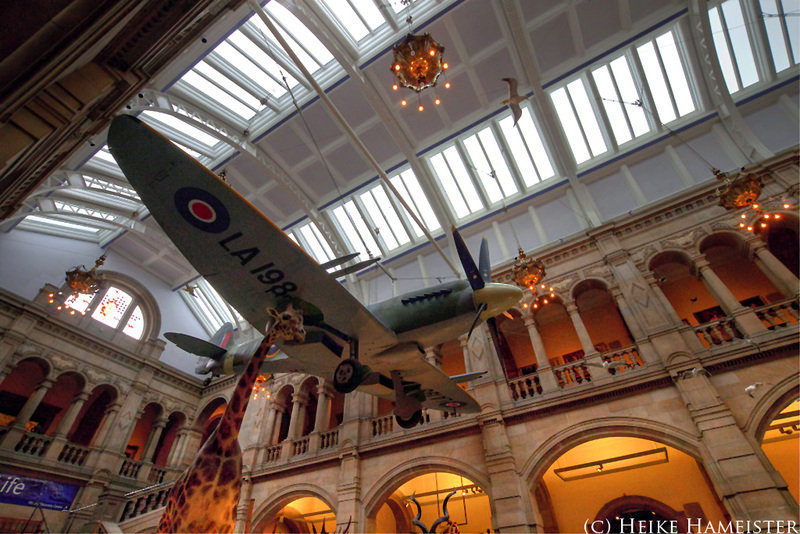 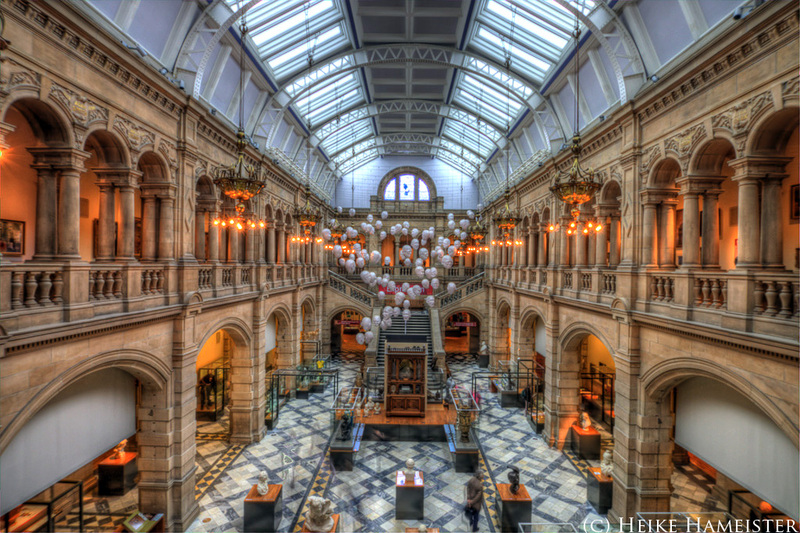 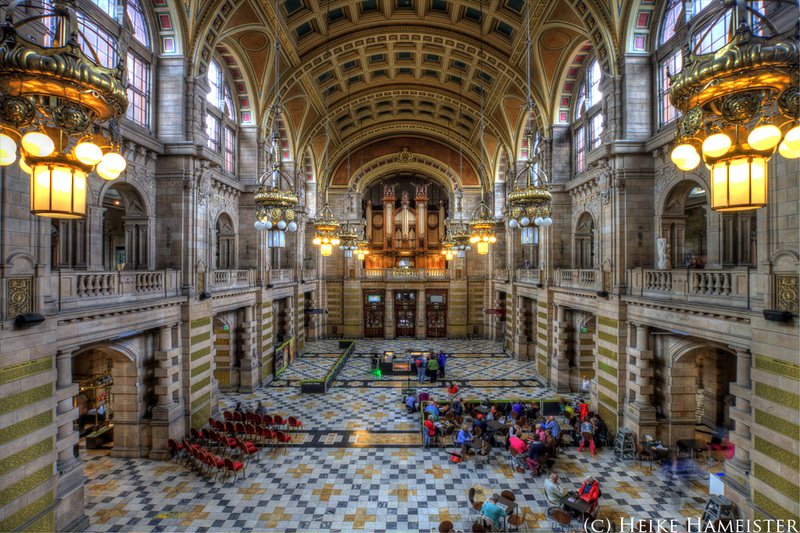 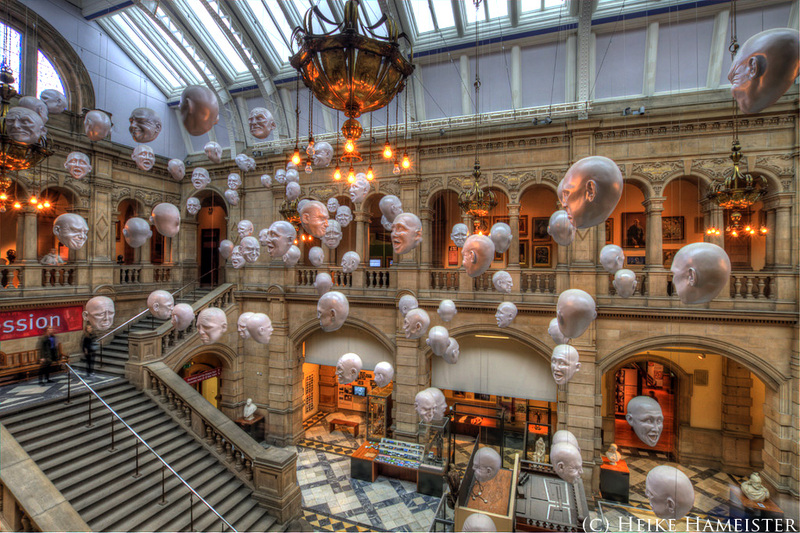 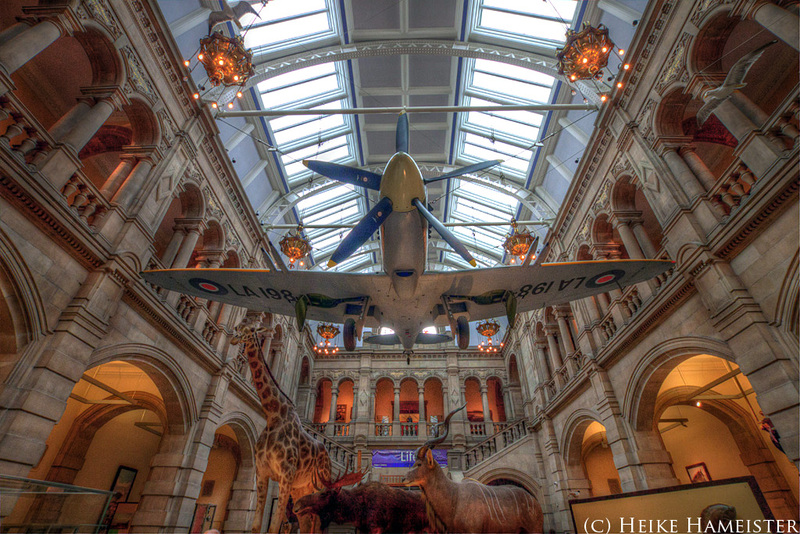 The Kelvingrove Art Gallery and Museum is located on Argyle Street, in the West End of the city Glasgow, Scotland. 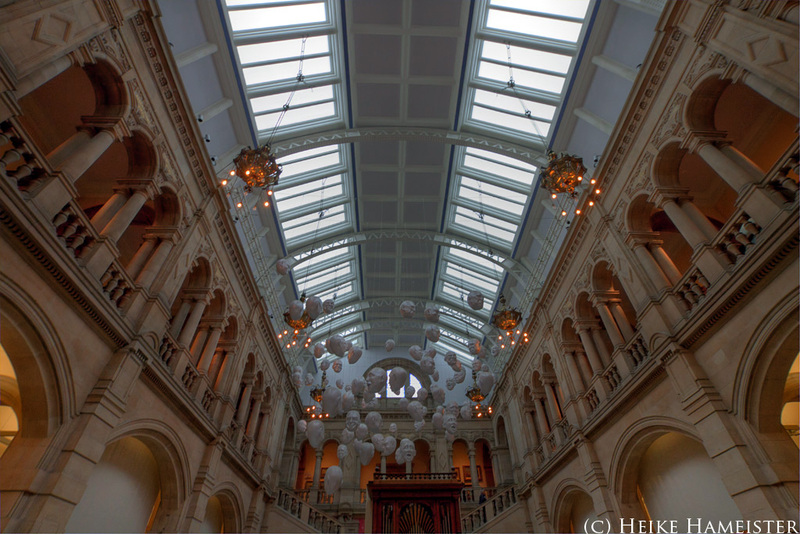 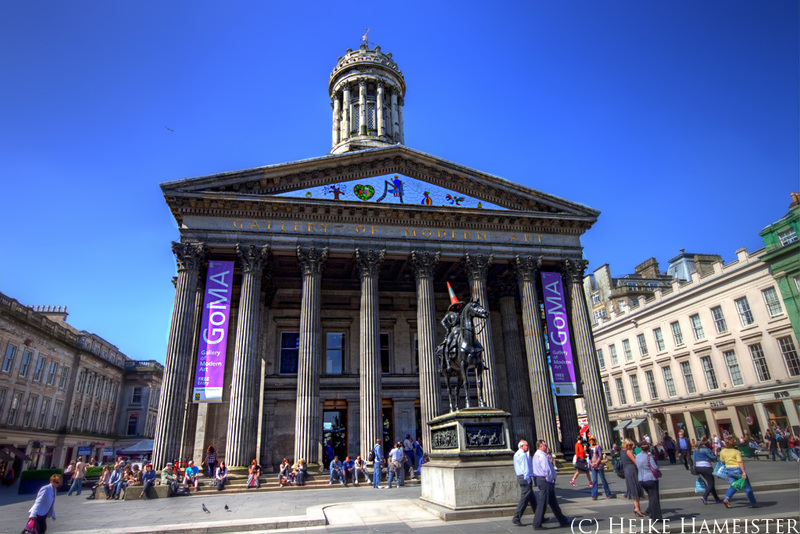 The gallery was opened in 1901 as a Palace of Fine Arts for the Glasgow International Exhibition held in the year. 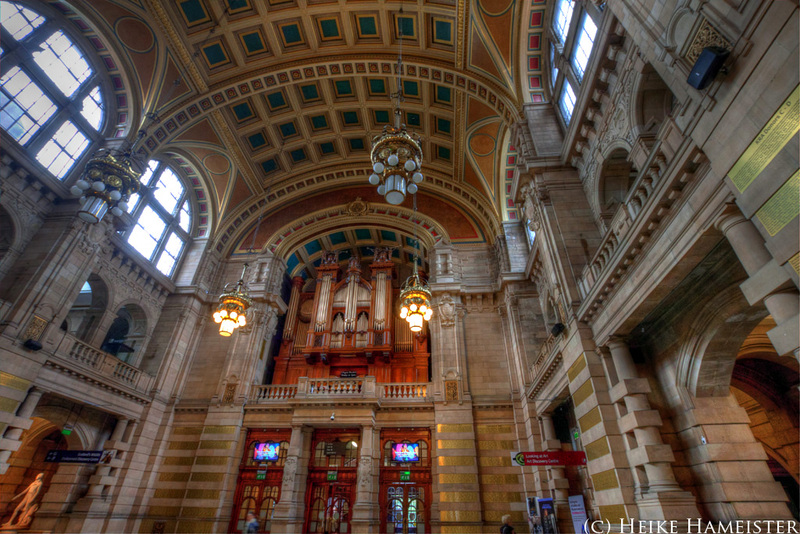 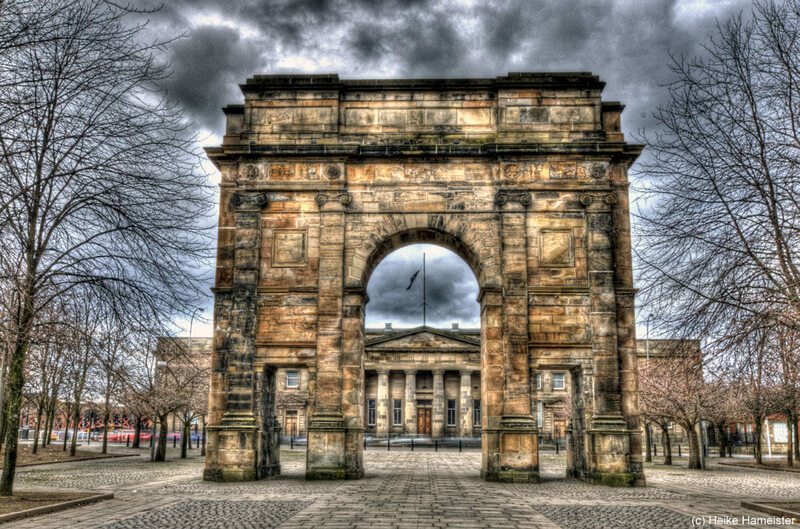 There is a popular myth in Glasgow, that the building was accidentally built back-to-front, but the grand entrance was always intended to face into Kelvingrove Park. 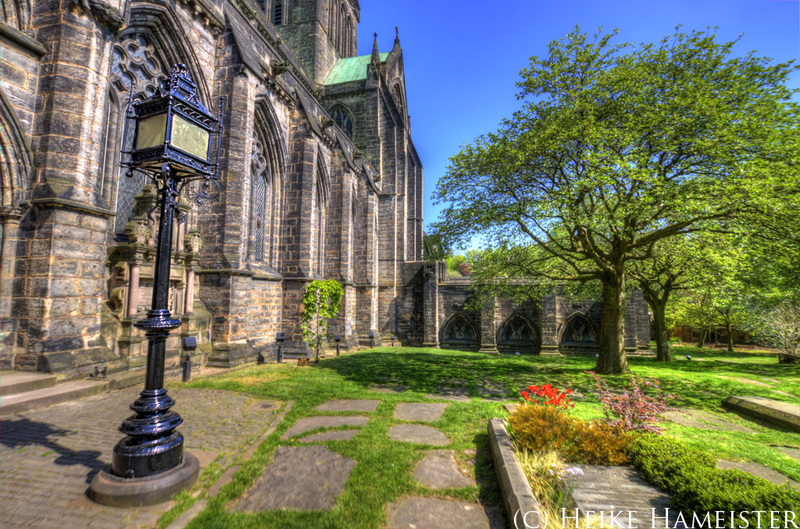 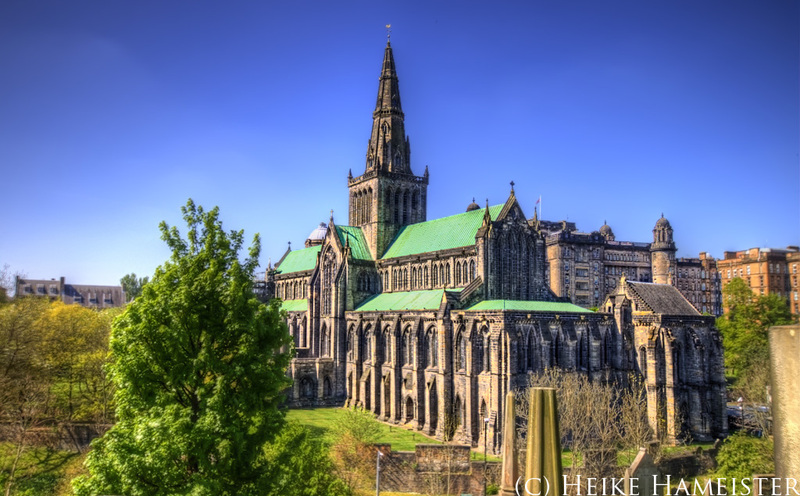 Glasgow Cathedral, also called St Mungo’s Cathedral was built before the Reformation from the late 12th century onwards and is located beside the Glasgow Royal Infirmary. 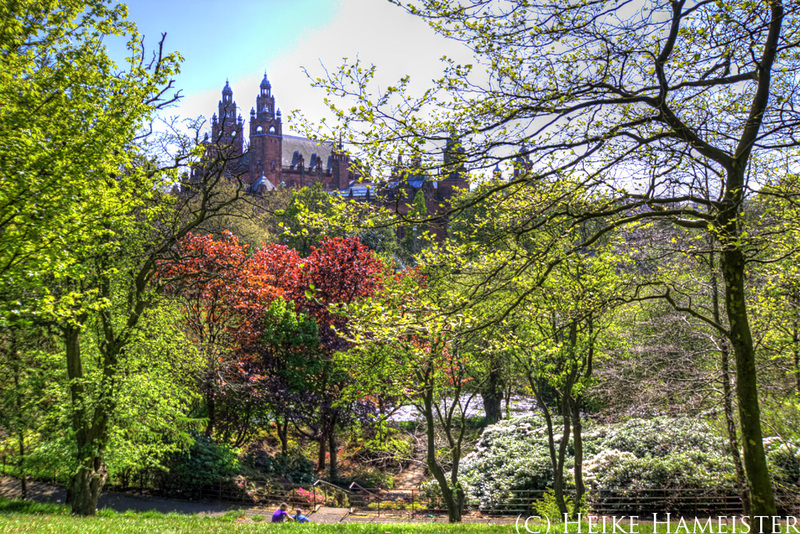 These photos were taken during a very sunny April day in Glasgow, Scotland. 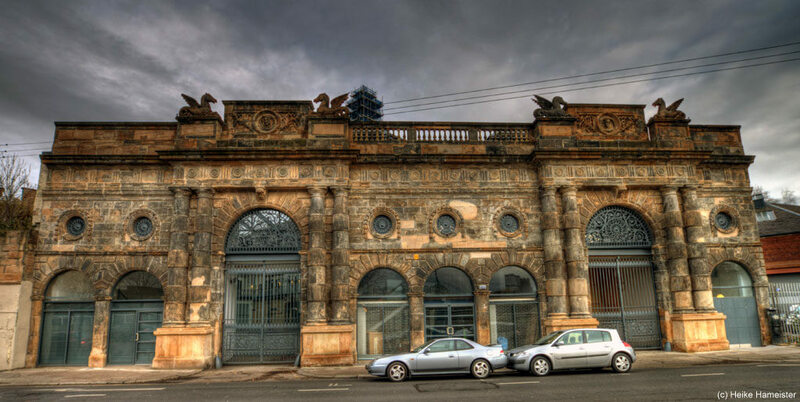 Glasgow is a very interesting city and has a lot of great new architecture mixed with old industrial buildings and beautiful art nouveau houses. 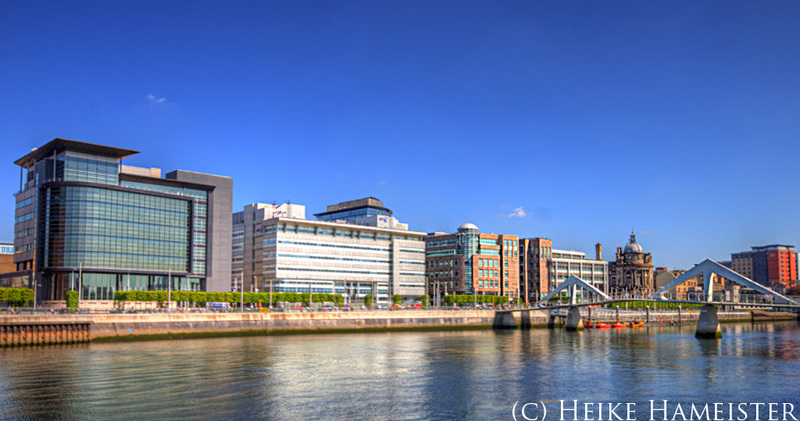 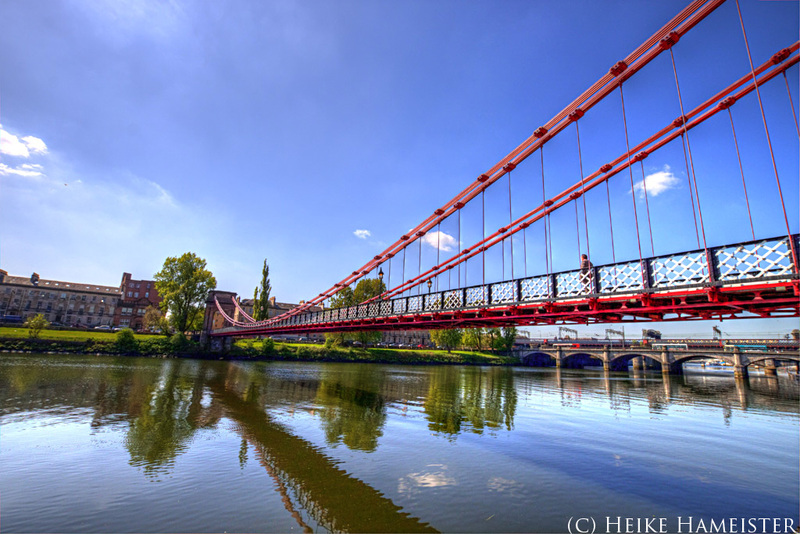 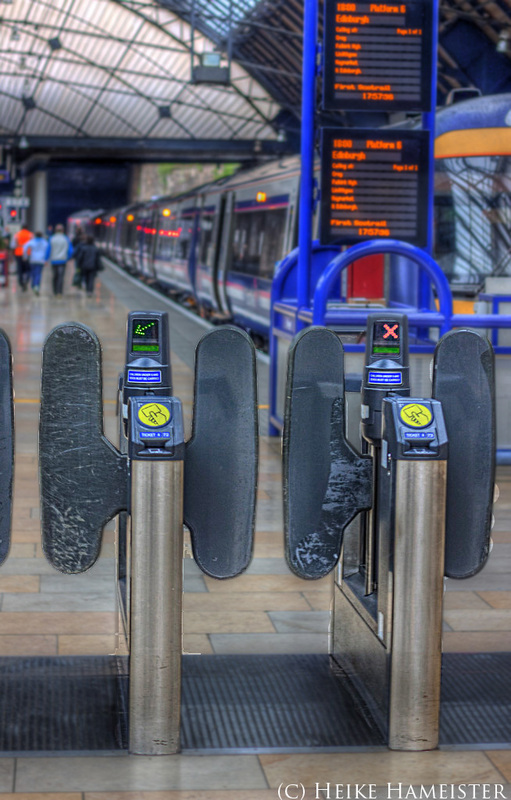 These photos were taken during a very sunny April day in Glasgow. 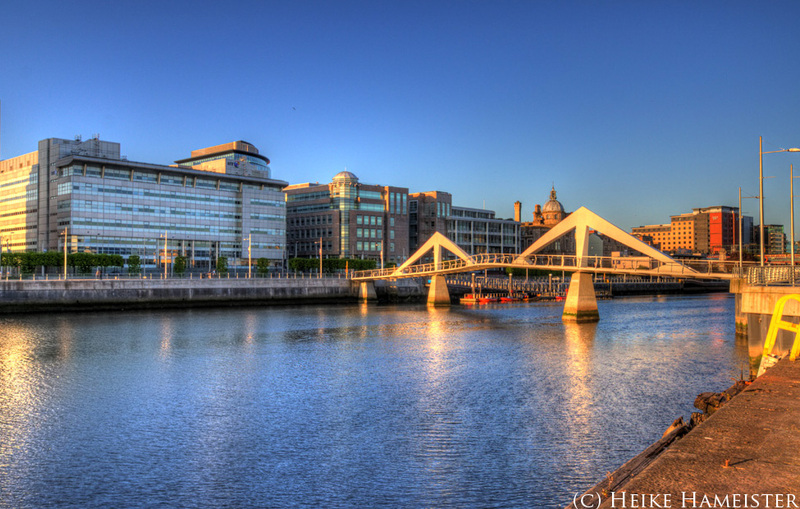 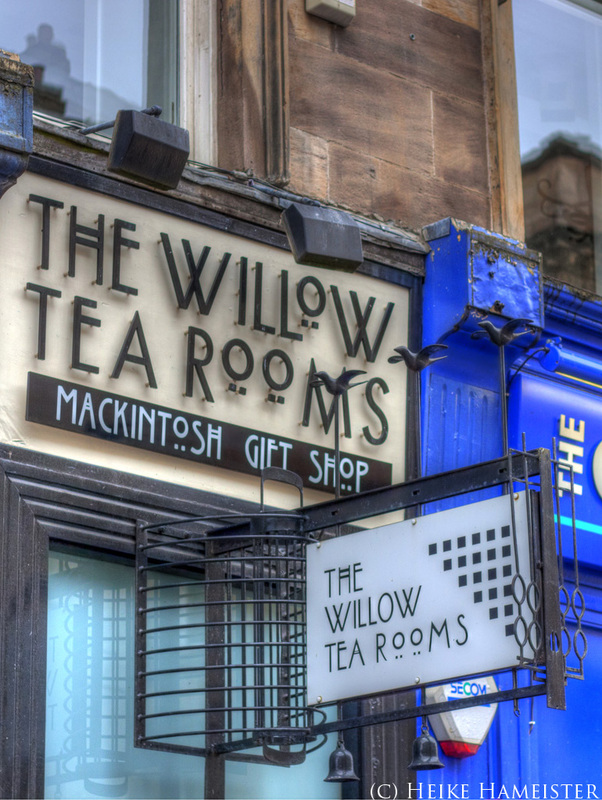 Glasgow is the largest city in Scotland and has a lot of great new architecture mixed with old industrial buildings and beautiful art nouveau houses. 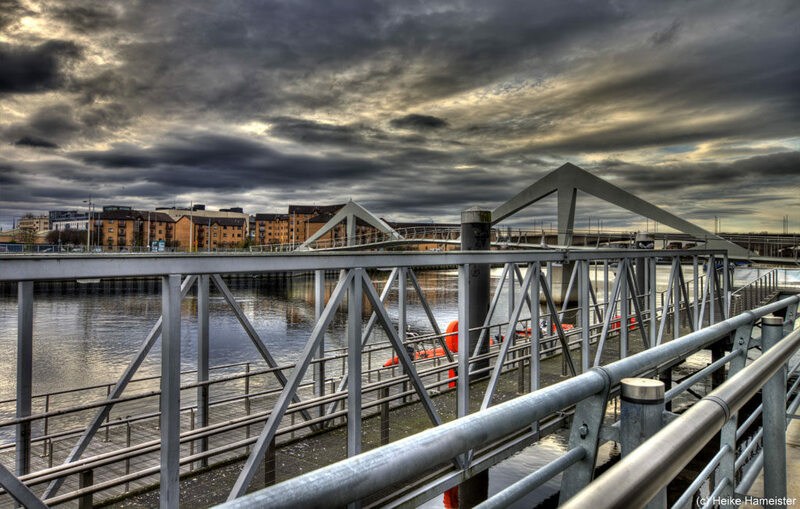 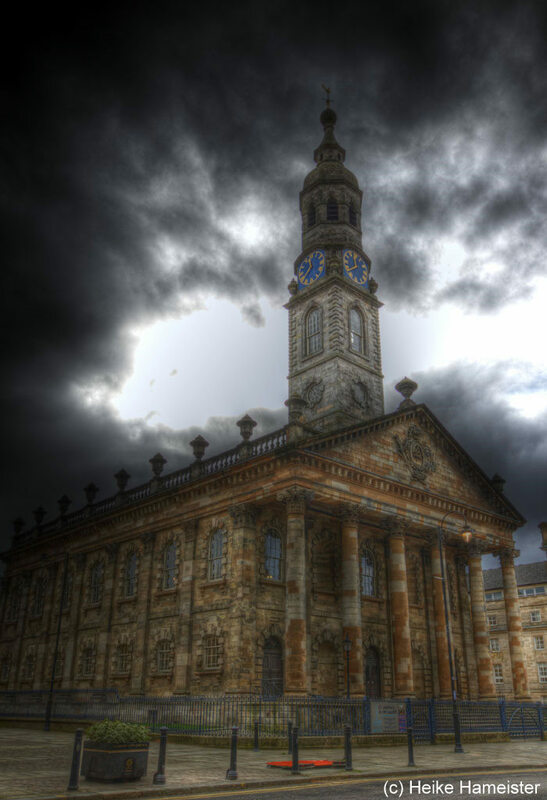 These photos were taken during a very cloudy November day in Glasgow. 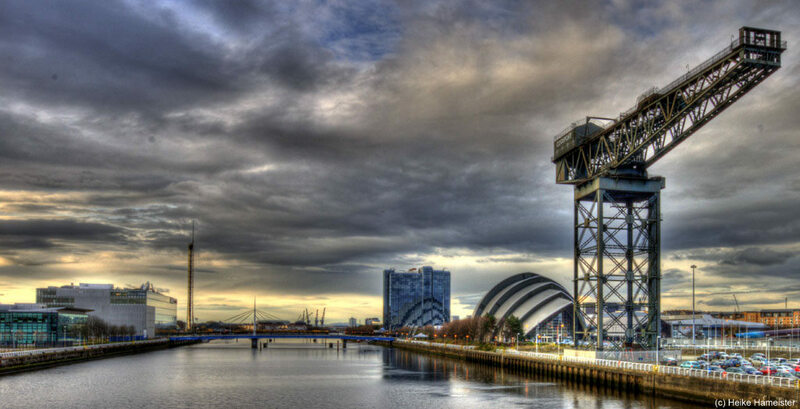 Glasgow is the largest city in Scotland and has a lot of great new architecture mixed with old industrial buildings and beautiful art nouveau houses. 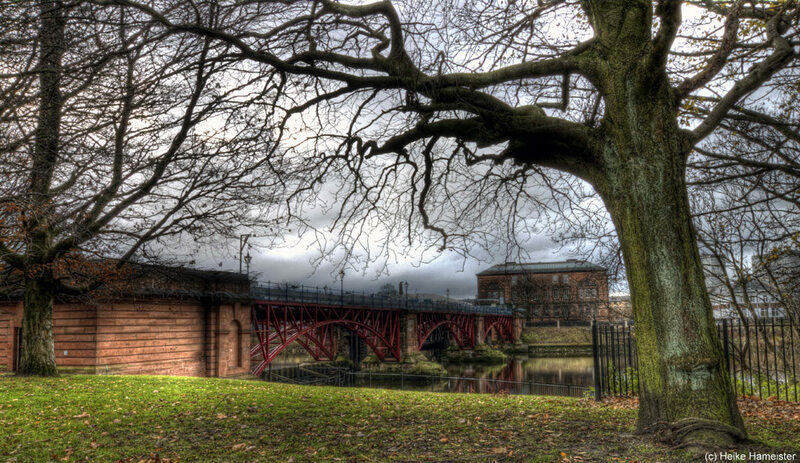 The East End of Glasgow is the home of the Glasgow Green, which is the oldest park in the city dating back to the 15th century. 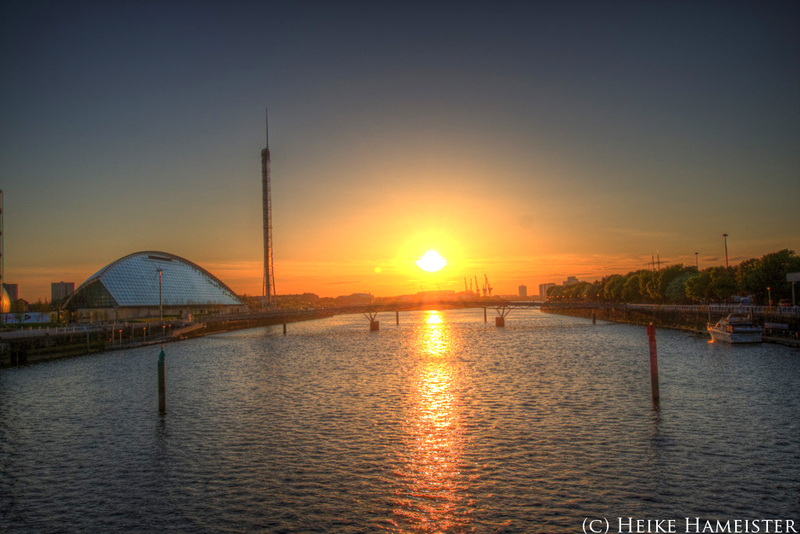 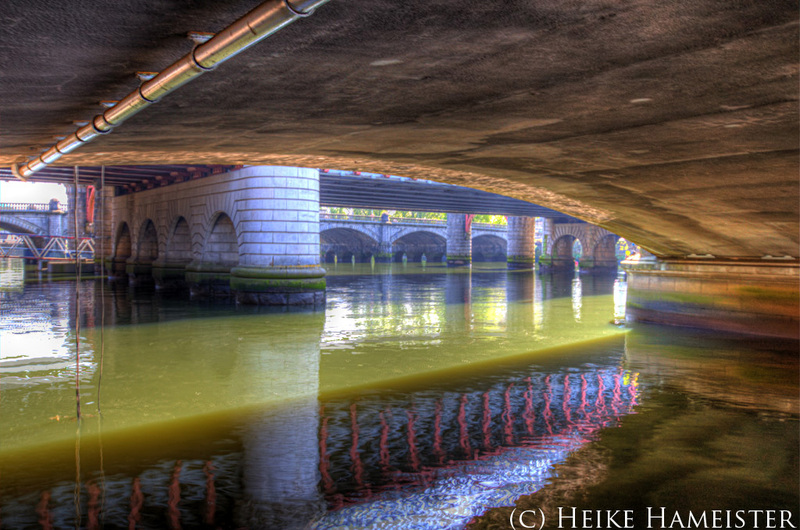 In the early days, the park was an grazing area, an area to wash and bleach linen and an area to dry fishing nets. 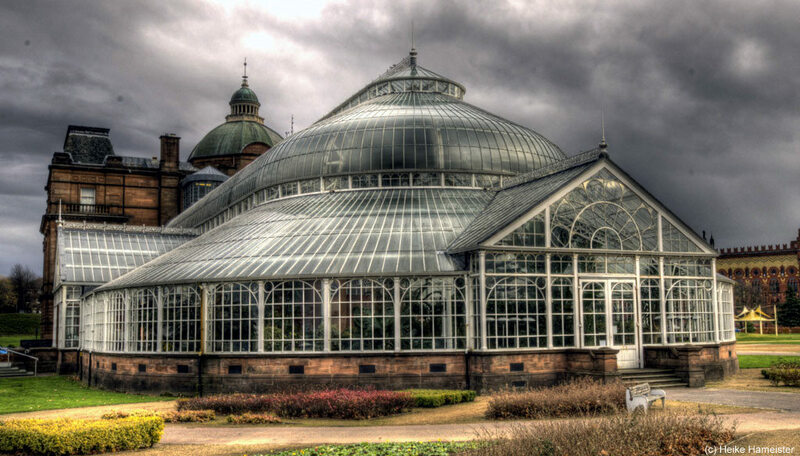 The People’s Palace and Winter Gardens were opened on 22 January, 1898 and was intended to provide a cultural centre for the people. 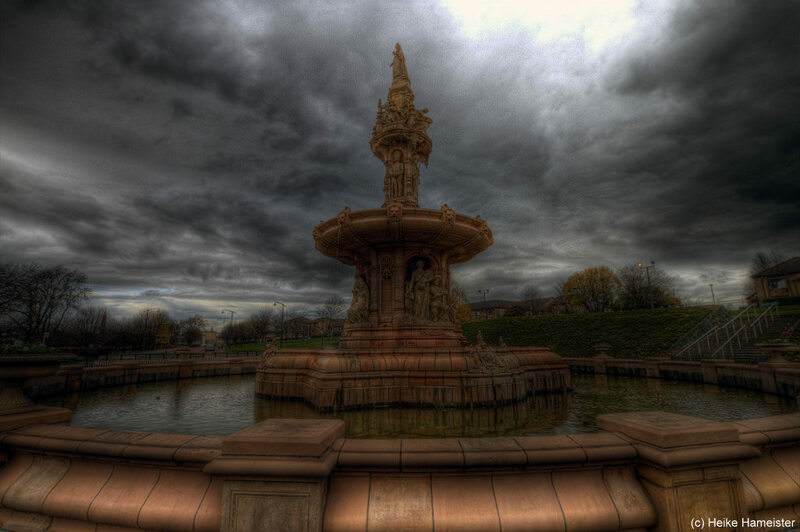 In 2005 further work was carried out when the Doulton Fountain was extensively refurbished and relocated to its present position in front of the People’s Palace. 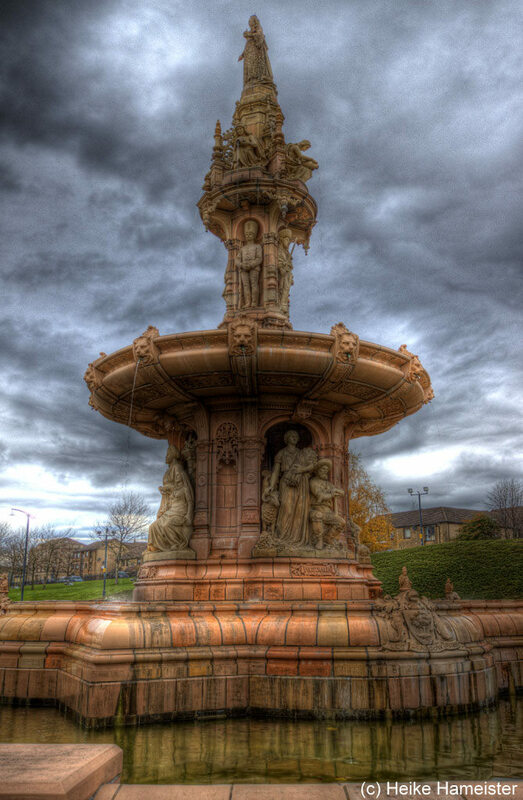 This 46 feet high and 70 feet across at its base, is the largest terracotta fountain in the world. 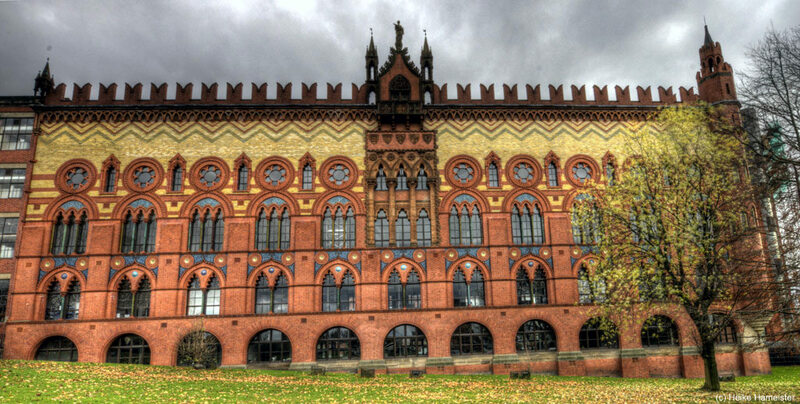 The Templeton Carpet Factory (Templeton Buisness Centre) was modelled like a buildings in Venice, because the wealthy citizens living in nearby did not wish to overlook a factory and it was decided the building should be of appropriate design for such a prominent location in the city. 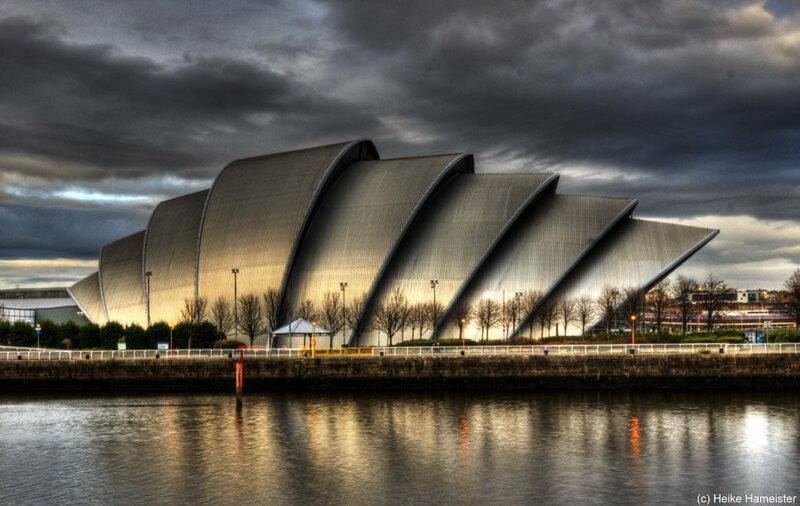 Today, there have been many live music events on Glasgow green on various scales.